German Marquez pitches on Saturday night in LA. Credit: Gary A. Marquez, USA TODAY Sports. 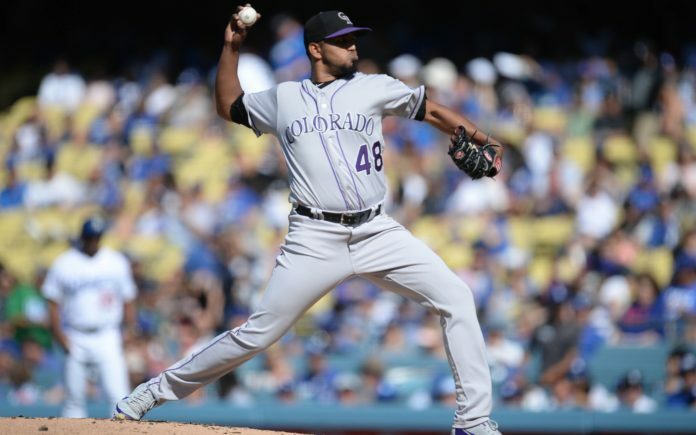 German (pronounced er-MAHN) Marquez continued the prominent pitching Saturday night after Tyler Anderson did well from the bump Friday, and the Rockies won 3-1 over the Dodgers in a game which featured only nine combined hits. Marquez pitched a perfect game through five innings before allowing a mere two hits, one earned run all while striking out nine in possibly the best game of his short career. Marquez and Dodgers starter Kenta Maeda worked through the first three innings clean before the Rockies finally got on the board in the fourth. D.J. LeMahieu started the inning off with a double to the left field corner, then Charlie Blackmon moved him over to third on a sacrifice fly. With Nolan Arenado at the plate, the Rockies’ superstar battled with Maeda for six pitches, eventually striking out but because of a passed ball, he reached first and LeMaheiu was able to score. In the fifth inning, Ian Desmond crushed his 17th home run of the season to push that lead to 2-0. While Desmond struggled mightily in the beginning of the year, he’s improved as time has gone on, especially hitting the long ball well. Meanwhile, Marquez’s perfect game, which went five innings, was broken up in the sixth when Enrique Hernandez hit a solo home run and then Chase Utley singled after that. Through six innings, the Rockies led 2-1. Until, that is, Chris Iannetta singled to score Trevor Story in the seventh inning, pushing the lead to 3-1. For Marquez, it was the second-best game of his career, going 8.0 IP, allowing two hits, one earned run with nine strikeouts. The only game arguably better came in May of 2017; he went 8.0 IP, gave up three hits, struck out eight and allowed zero runs. Unfortunately, it was the second straight night he starter — Anderson on Friday — didn’t get a chance to finish the complete game and pitch in the ninth inning. Instead, Adam Ottavino came in and shut down the Dodgers to end the game a win for the Rockies. For Colorado, this is now the third straight win, a huge winning streak from a struggling team who had lost four straight before that. 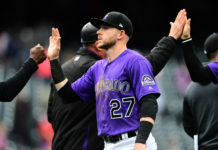 The Rockies now are one game under .500 at 41-42, 6.5 games back of the Arizona Diamondbacks in the NL West. Tomorrow’s 2:10 p.m. MT first pitch is the Rockies’ chance to sweep the Dodgers in L.A.